At work the other day I took a reservation from a guest whose only dietary restriction was a strong aversion to poached or fried eggs on top of her dish. She pointed out that this was becoming rather trendy (it has), and I got to thinking: that wasn't the first time egg non-lovers have mentioned this (disturbing to them) trend. I've actually been asked why one would "ruin" a perfectly good dish with an egg! As someone who loves eggs on top of almost anything, my question is: why wouldn't you make your dish more awesome with an egg (or two)? For one, it's an easy protein fix, especially if your dish is rather carb-heavy. They elevate the aesthetics of the dish, in my opinion, with their bright whites and sunshiny yolks. Most importantly, they just taste really damn good on everything. Whether it's the crispy fried edges of the white, or the deliciousness of the yolk, eggs just make everything taste better. Which is why they're being put on top of everything. Like this ridiculously simple little dish. While my love affair with eggs on top of other food has been well documented, my current egg obsession is having eggs atop a bed of sauteed greens. Any greens. With the constant fatigue caused by being in perpetual pain or chronically sick, I keep looking to streamline my already super simple cooking process. And for a while, I will admit that greens 'n' eggs was the best I could do. I'm always in search of one-dish meals that are as balanced as possible, and this was about as balanced & easy as I could get. Fiber & other good nutrients from the greens; protein from the egg; and a splash of color and extra flavor (not to mention some Vitamin C and lycopene) from the salsa. Done and done. The other huge reason why this became a staple in Poor Girl's kitchen over these past few months is that it's really, really, really cheap. Really. Even if I went the pre-packaged kale route on weeks when I was too sick to go to my beloved farmers' market to get the super fresh kind, I was only shelling out about $2 per 16 oz. bag. Taking advantage of sales on eggs also kept costs low. About the only thing I had to forego during the hard tomato-less winter months was a nice pile of fresh tomatoes for salsa making. Fresh tomatoes in late winter and early spring are an abysmal thing - they're either pink balls of styrofoam covered in wax and stickers alleging freshness, or hothouse tomatoes that cost about $6/lb. Either way, it's a very difficult time of year for a tomato addict. If you're unable to afford decent tomatoes for homemade salsa fresca, or if the ones at your store just don't make the cut, feel free to go the store bought route. Many in-store delis have pretty decent salsa fresca without all the crazy jarred salsa additives and preservatives. I don't usually suggest store bought over homemade, especially when it comes to something as sacred as salsa, but sometimes you've gotta do what you've gotta do. Fortunately, summer is pretty much here for most of us, so ripe, juicy tomatoes at affordable prices will start cropping up everywhere. You can follow my pico de gallo recipe, or use your own fresh salsa recipe as your topper for this dish. How garlicky you go is up to you, but I highly suggest going a little heavy on the garlic for maximum flavor. 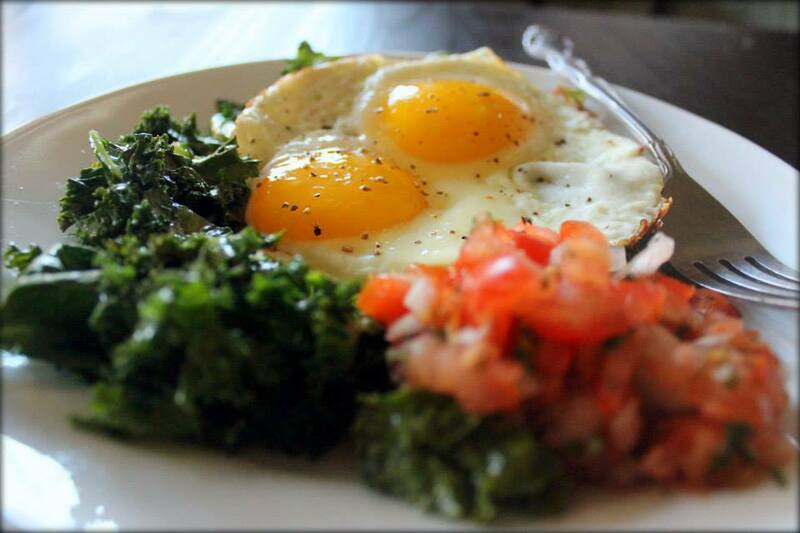 It gives the kale a nice kick and complements the eggs beautifully. Looking for a good salsa recipe to finish off this simple meal? Check out my Chunky Pico de Gallo here. 1. Heat 1 tablespoon of oil in a large skillet. Add the garlic and cook until fragrant and just golden brown. Add the kale, sprinkle with salt & pepper, and sautee for 1-2 minutes only, until the kale begins to soften. Remove from heat. The residual heat from the pan will continue to cook the kale without overdoing it. 2. In a separate pan, heat the rest of the oil and add the eggs. Fry until they're done to your liking, then remove from heat. 3. 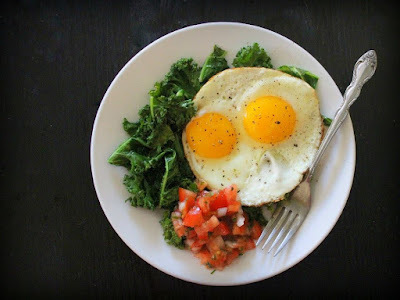 Place a generous amount of garlicky kale on a plate. 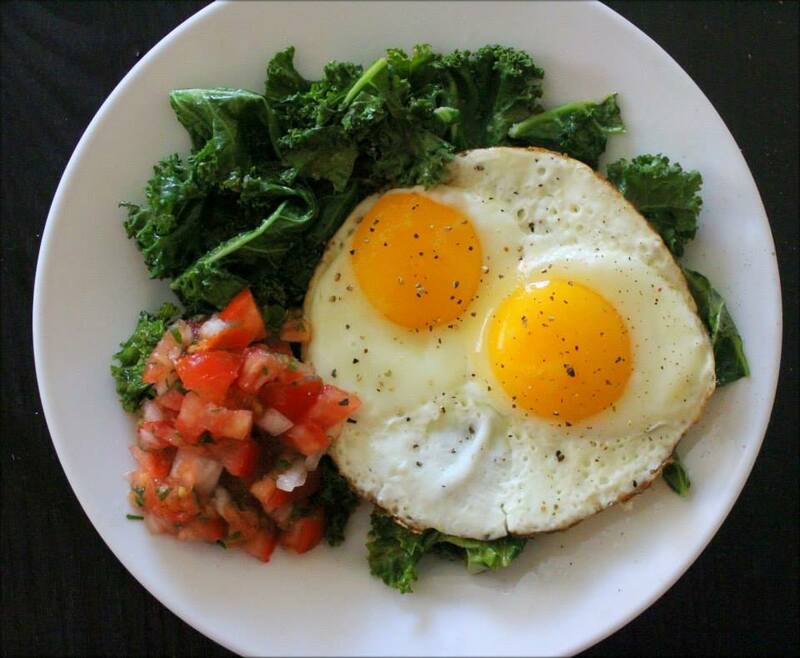 Top with the eggs, add as much salsa as you like, and enjoy!